A couple weeks ago I shared my under-the-eaves bedroom cozied up for holiday guests. This got me to thinking about bedrooms in general and I found some pretty, inspirational bedroom ideas. 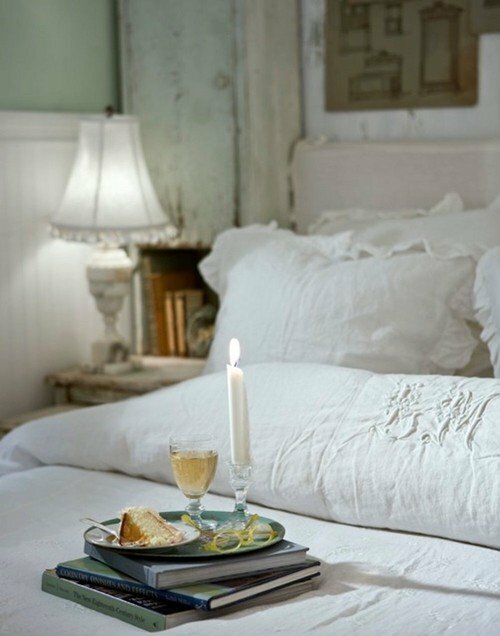 White ruffled bedding in soft linen fabric creates a dreamy shabby chic style bedroom. A sweet little table lamp sheds just the right amount of light for nighttime reading. 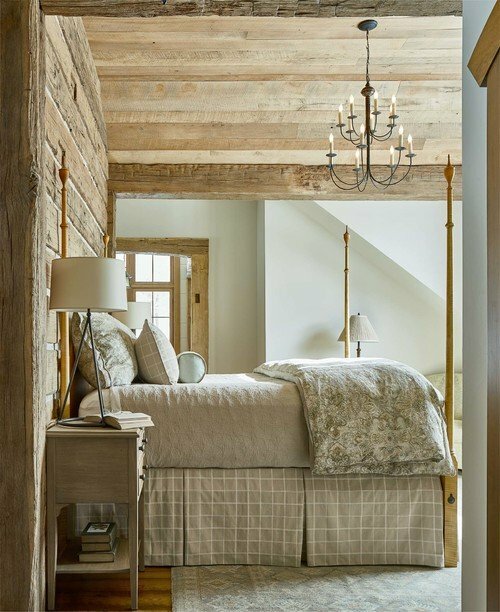 A rough-hewn wood ceiling and plank walls creates a rustic and cozy vibe in a farmhouse inspirational bedroom. 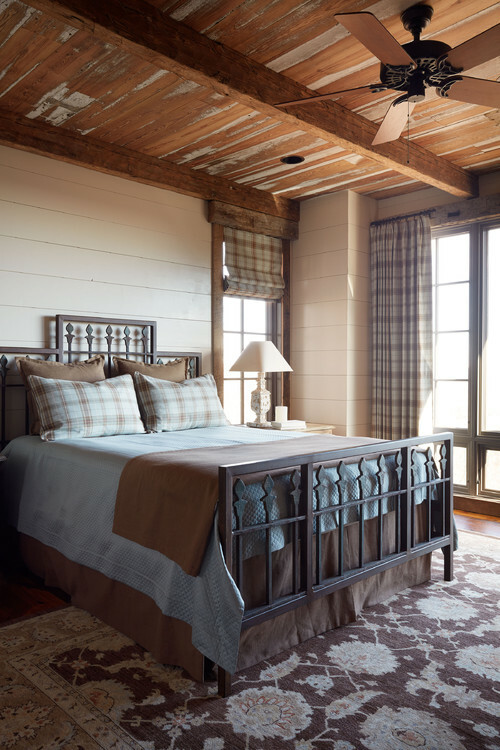 A pair of pillow shams repeat the plaid fabric of the curtains and shades helping to tie the room together. 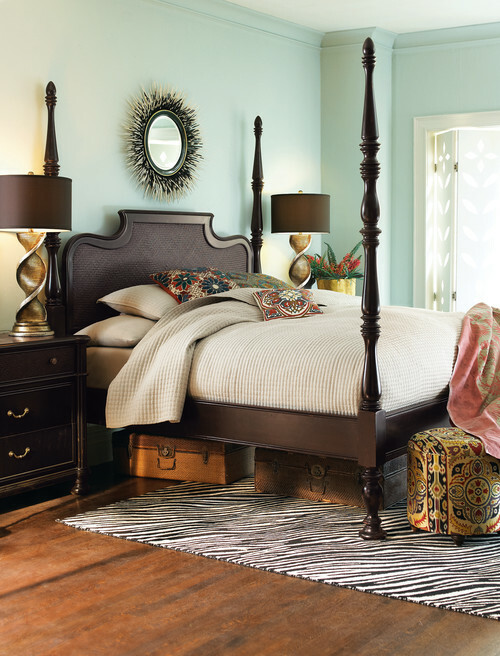 Warm wood tones cozy up beautiful, traditional style bedroom. I’ve really been drawn to brown and creamy tones lately. I’m not sure why – they were never a favorite of mine in years past. 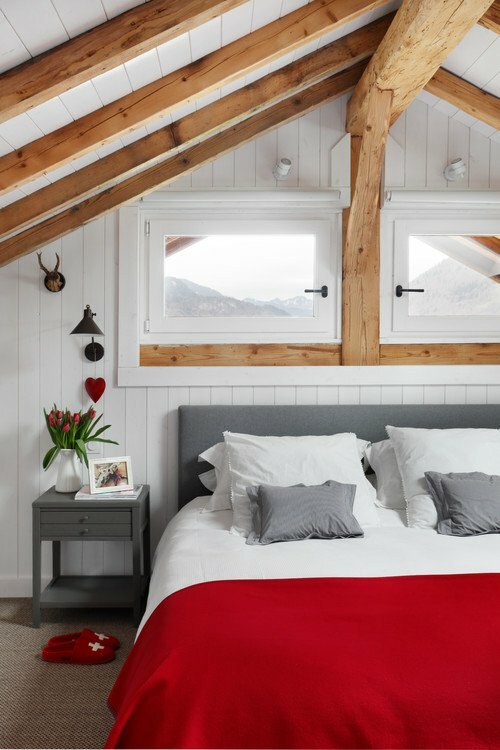 Scandinavian style has always tugged at my heart strings and this red and gray inspirational bedroom is perfect for winter nights. If traditional is more your style, you’ll probably be a fan of this inspirational bedroom with its four-poster bed and pale blue walls. Pale yellow walls are reminiscent of morning sun streaming through the mullioned windows. A pretty bouquet of fresh fragrant lilacs create a springtime feel. The easiest way to spruce up a bedroom is with rich linens and plenty of pillows. Or simply swap out your light fixture for a charming chandelier to get a fresh look. I love this bedroom with its rough wood walls and ceiling. Anyone who enjoys waking up to the sun would love sleeping in this bed surrounded by windows. Leave the curtains open and night and enjoy gazing at the stars and moon. This final bedroom reminds me of a bed and breakfast. 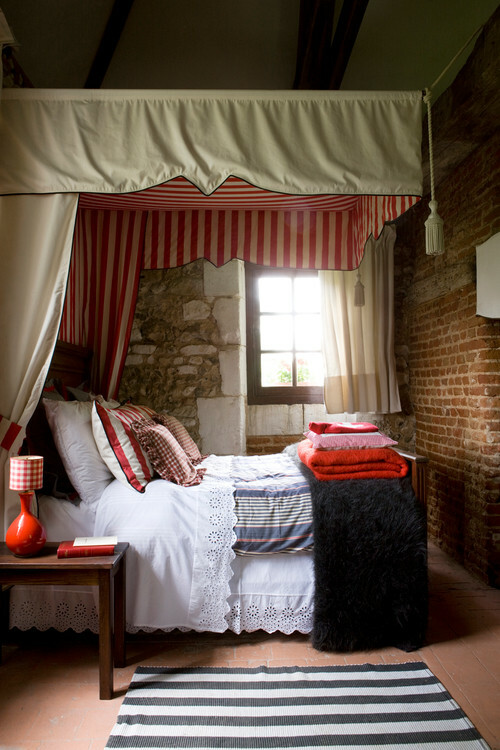 Brick and stone walls are paired with a luxurious fabric canopy. I’d feel like I was spending the night in a castle if I slept here! Freshen up your bedroom during this busy season and you’ll enjoy climbing into bed at the end of a busy day shopping and baking for the holidays. I love to window shop bedrooms and get ideas of how to change mine up, thanks. Nice selection. Enjoyed it. Thanks.